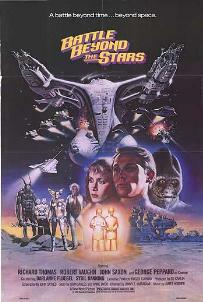 Today’s feature is the b-movie space epic, Battle Beyond the Stars. The screenplay for Battle Beyond The Stars was written by writer/director John Sayles, whose credits include Piranha, Alligator, The Howling, The Brother From Another Planet, and Lone Star, among others. Battle Beyond The Stars was directed by Jimmy Murakami (Humanoids From The Deep, The Snowman), with some uncredited ghost direction by the b-movie master, Roger Corman, who acted as the film’s executive producer. The cinematographer for the film was Daniel Lacambre, who also shot the b-movies Saturday the 14th, Humanoids From The Deep, and The Wild Racers. Battle Beyond The Stars featured two credited editors: Allan Holzman, who cut Jonathan Demme’s Crazy Mama, the Alien knock-off Forbidden World, and even won an Emmy for his work on the documentary Survivors of the Holocaust, and R.J. Kizer, who cut Hell Comes To Frogtown and Galaxy of Terror. The music for Battle Beyond The Stars was composed by James Horner, who would go on to a long and lauded career that would earn him 2 Academy Awards. Films featuring his music include Humanoids From The Deep, Star Trek II: The Wrath of Khan, Krull, Aliens, Cocoon, Willow, Field Of Dreams, 48 Hours, Braveheart, Apollo 13, Titanic, A Beautiful Mind, and Avatar. The makeup and special effects team for Battle Beyond The Stars included Frank DeMarco (The Beastmaster, The Terminator), Roger George (Chopping Mall, Ghoulies, Humanoids From The Deep), Sue Dolph (Galaxy of Terror, Alligator), Ken Horn (Swamp Thing, Halloween 4), Karen Kubeck (Iron Eagle, The Sword and The Sorcerer), Rick Stratton (The Stuff, Wild Wild West), and Steve Neill (Laserblast, The Stuff, Q: The Winged Serpent, It’s Alive III, Full Moon High, The Crater Lake Monster, God Told Me To). The significant visual effects unit for the movie included Barry Zetlin (Children of the Corn II, Friday The 13th Part VII), Robert Skotak (Tank Girl, Darkman), David Riley (Starship Troopers), Tony Randel (Escape From New York), Eric Peterson (The Mangler, Ghost Dad, Masters of the Universe), John Muto (Night of the Comet), Kenneth Jones (The Core, Contact, Moontrap), Alec Gillis (Mortal Kombat, Wolf, Trick or Treat), Deborah Gaydos (Masters of the Universe, Saturday the 14th), Jonas Thaler (Mortal Kombat: Annihilation), Randall Frakes (Hell Comes To Frogtown), Michele Ferrone (Son of the Mask, RoboCop 3), Steve Caldwell (Daredevil, Phone Booth), Chris Brightman (Piranha), Larry Albright (1941), Chuck Comisky (Mortal Kombat: Annihilation), and Pat Sweeney (Howard The Duck). The cast of Battle Beyond The Stars includes John Saxon (A Nightmare On Elm Street, Hands of Steel, The Last Samurai), Robert Vaughn (The Magnificent Seven, Pootie Tang, Buried Alive, BASEketball), Richard Thomas (The Waltons), George Peppard (The A-Team), Morgan Woodward (Cool Hand Luke), Sam Jaffe (Ben-Hur), Sybil Danning (Hercules), and Darlanne Fluegel (Once Upon A Time In America, Lock Up). James Cameron, who is now one of the most lauded filmmakers working today, got his start in feature films on Battle Beyond The Stars, on which he provided art direction and visual effects work. Battle Beyond The Stars was intended as a space odyssey adaptation of the popular western, The Magnificent Seven. Interestingly, The Magnificent Seven itself was heavily based on Akira Kurosawa’s epic, Seven Samurai, making Battle Beyond The Stars a re-imagining of a re-imagining. 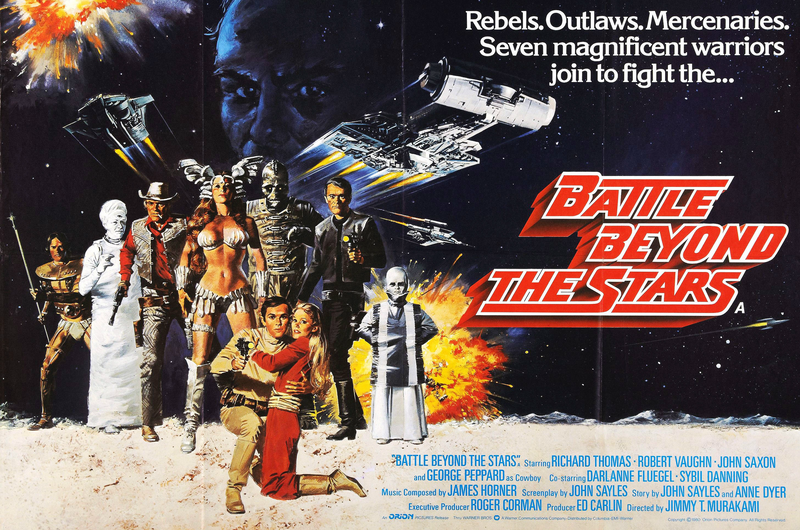 Roger Corman reportedly made Battle Beyond the Stars after noting the success of Luigi Cozzi’s Star Wars knock-off, Starcrash, which proved that a space epic could be made on a b-movie budget. Battle Beyond The Stars currently holds a 5.4 user rating on IMDb, along with Rotten Tomatoes aggregate scores of 45% from critics and 42% from audiences. At the time, Battle Beyond The Stars was the highest-budget movie in Roger Corman’s lengthy filmography, coming in at roughly $2 million. 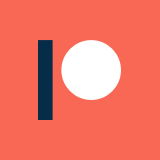 Ultimately, it proved profitable, raking in a reported $7.5 million in theatrical grosses. Much like Starcrash, I absolutely adore Battle Beyond The Stars. However, I actually think it borders on being a legitimately good movie, rather than a good-bad movie. There are certainly some entertainingly cheesy performances, but on the whole, this is a genuinely enthralling space epic, and an interesting and imaginative retelling of Seven Samurai. Some would argue, and I might agree, that Battle Beyond The Stars was the pinnacle of Roger Corman’s film making career. Seeing how many talented unknowns were assembled to create the film really makes it the perfect encapsulation of Roger Corman’s method: spot talent, give them a hard budget, and give them a shot. Given how low the budget was, it is downright amazing how good this movie come out, and how solidly it generally holds up today. For comparison’s sake, the budget for The Empire Strikes Back, which also came out in 1980, was estimated at between 20 and 30 million dollars: 10 to 15 times more than the budget of Battle Beyond The Stars. Honestly, does Empire look 10 to 15 times better than Battle Beyond The Stars thanks to those funds? I don’t think so. 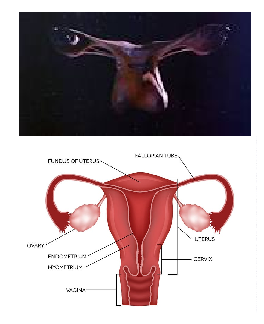 …maybe the ship designs weren’t so great. Battle Beyond The Stars gets an enthusiastic recommendation from me for just about anyone: Star Wars fans, bad movie fans, sci-fi enthusiasts, film buffs: there is a lot of enjoy with this movie. The cast is pretty impressive, the design is great, the story is interesting, and the whole thing is paced far better than your typical b-movie. As much as I love Starcrash, a lot of its flaws are overcome in Battle Beyond the Stars, and the result is a far more watchable movie. It is probably a controversial opinion, but Battle Beyond The Stars is, in my opinion, a paragon of its genre and era: it may be the best representative of late 70s / early 80s b-movies you’ll find.